The awesome "Questioneers" series has seen the dream team of Andrea Beaty and David Roberts celebrate the achievements of a trio of awesome little kids who each have a very special talent of their own. If you're familiar with Rosie Revere, Iggy Peck, and Ada Twist and love their picture book outings - but fancy something with more of a word count (but still highly illustrated with David's awesome pics) then you really are in for a treat. 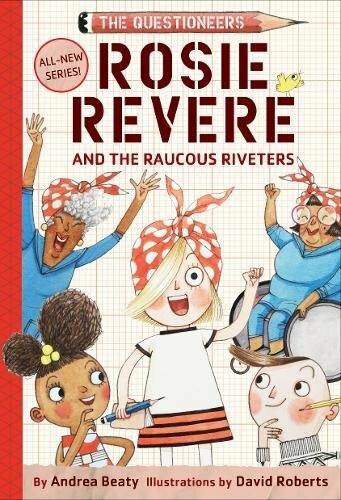 "Rosie Revere and the Raucous Riveters" is book one in this latest chapter series with Rosie making her chapter book debut, and Iggy and Ada following along very soon. Rosie Revere may be no stranger to flops and fails, kerfuffles and catastrophes but she's a mighty girl who never gives up on her dream. After all, she’s an engineer, and engineering is all about perseverance! But sometimes, Rosie has a really important project to tackle―one that feels much bigger than she believes she can cope with. When Rosie’s beloved Aunt Rose and her pals the Raucous Riveters―a gaggle of fun-loving gals who built airplanes during World War II―need her help, it’s up to Rosie to save the day! Will Rosie be able to invent a contraption to help one of the Riveters paint in the annual mural competition? After one flop . . . then another . . . and another . . . Rosie starts to lose hope. But thanks to some help from her classmates Iggy Peck and Ada Twist, Rosie creates the Paintapolooza! and, along with the Riveters, rediscovers the meaning of Home. It's a beautifully written and heartfelt homage not just to those amazing women who made such an important contribution to the war effort, but to mighty little girls who dig their heels in and persevere in the face of adversity. We loved the message that sometimes you need a mess of help from your friends to succeed too. It's the perfect transition from picture book to early chapter reader and we can't wait to see Ada and Iggy's solo chapter outings too. "Rosie Revere and the Raucous Riveters" by Andrea Beaty and David Roberts is out now, published by Amulet Books (kindly supplied for review).